Life of a Catholic Librarian: The Catholic Nook: A patron saint for crafty, artistic folks? The Catholic Nook: A patron saint for crafty, artistic folks? "I wonder who the patron saint of...(fill in the blank) (let's say Zumba!) is?" Obviously, we sometimes have to adapt a patronage, since there isn't *specifically* a saint for people who enjoy Zumba. ;-) So, when I Googled "patron saint knitters," I found a couple of interesting people, one of whom is St. Catherine of Bologna. Want to know why I was drawn to her? She's the patron saint of the arts. Visual and performing arts, to be exact. Hello, kooky Catholic belly dancer over here! St. Catherine certainly seems like a patron that I can adapt (along with St. Cecilia, patron saint of music) for dancing. But it seems to be that a patron for artists can be a patron for all crafters, including knitters and crocheters. We're creating art too! So, what do we know about St. Catherine of Bologna? Well, we know that she was born in Italy in 1413, to an important family in the area. She was the daughter of a diplomatic agent to the Marquis of Ferrara, and her early education included many of the arts that were prevalent in the city at that time: music, literature, painting and dancing. Early in her life, Catherine expressed the desire to dedicate herself to Jesus. As a teenager, she entered the Franciscans as a Tertiary (a Third Order, lay member). Ultimately, she became a Poor Claire, and was appointed the superior of a convent in Bologna. During her time there, she continued to engage in her loves among the arts: painting, playing the viola, and writing poetry. She also composed a treatise detailing mystical visions of Jesus, and torturous visions of Satan. In 1463, she became ill during Lent, and passed away on March 9th (also her feast day) of that year. Her body, later exhumed after people noticed a sweet smell emanating from her grave, was found to be incorrupt. She was canonized in 1712. Well, well, well. A patron saint of the arts! I think that she is perfect for us, yes? 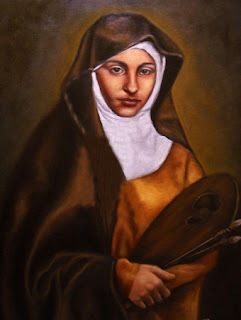 Do any of you have a devotion to St. Catherine of Bologna? Do write in with your thoughts! I love that there are so many holy men and women to help us on this journey! I agree with you- St Catherine of Bologna is the perfect choice for crafty endeavors! Catherine, thank you so much for your comment! Agreed, the Communion of Saints is such a marvelous and consoling thing.